"Ascent of the Prophet to Heaven"
Islamic tradition holds that images of religious figures encourage idolatry and, hence, detract from the proper worship of Allah. For this reason, you will find few paintings or drawings of Muhammad. In the well-known painting above, the face of the principal figure is not shown. In this way, the painting symbolizes, rather than illustrates the Prophet. 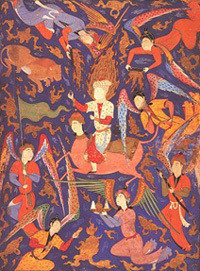 This particular painting depicts the Night Journey (see text), during which Muhammad rode a creature called a Buraq from Earth to heaven and back. When an historical figure has religious importance, it is difficult to separate fact from myth; to true believers, historical accuracy is less important than dogma. This is certainly the case with Muhammad (c.570-632), the prime mover in the establishment of Islam. For this reason, verifiable details about the life of Muhammad are sketchy. We know that he was born around 570 in Mecca, a city near the coast of the Red Sea in what is now Saudi Arabia. Muhammad's father died several weeks before Muhammad was born, and his mother died when the young boy was only 6 years old. Muhammad went to live with his paternal grandfather, but when the old man died two years later, Muhammad was raised by his paternal uncle, Abu Talib. For the next 40 years, Abu Talib acted as a surrogate father, taking care of Muhammad and lending him support. As a young man, Muhammad was a businessman, managing a caravan that transported goods to Syria. Over time, Muhammad earned a reputation for honesty and kindness and, eventually, he caught the eye of the owner of the caravan, a wealthy, twice-widowed woman named Khadijah. Although Muhammad was only 25 years old and Khadijah was 40, she had intermediaries propose marriage. Muhammad accepted, and the marriage was long-lasting and successful. Indeed, in Khadijah's lifetime, Muhammad did not take any other brides, which was unusual in a culture where men routinely practiced polygamy. In time, Khadijah bore Muhammad five, six or seven children (depending on which version of Muhammad's life you believe). Unfortunately, all of Muhammad's children but one, a daughter named Fatima, died in his lifetime. The boys, in fact, all died at an early age, an especially devastating tragedy in a patriarchal society. Moreover, of the daughters, only Fatima had children who lived past infancy. Hence, it is only through Fatima that Muhammad had descendents. By the time Muhammad was 40 years old, in the year 610, he was making regular retreats to Mount Hira in order to be alone and to meditate. According to Islamic tradition, on one such trip, Muhammad heard the voice of the angel Gabriel, who spoke to Muhammad with the word of God. The first message God gave Muhammad was the same message he had given to Abraham in the Old Testament: that there is only one true God, that all other gods are false, and that he (Abraham/Muhammad) must spread the word. From time to time, during the rest of his life, Muhammad received many messages from God, all via Gabriel. These messages revealed many details regarding God's wishes and advice and, eventually, they were written down in the Moslem holy book, the Qur'an. As such, God's revelations to Muhammad form the basis of Islam. Notice the difference between what Moslems believe about Muhammad and what Christians believe about Jesus. Christians believe that Jesus was divine, the actual son of God. Moslems believe that Muhammad was a mortal man, not at all divine. Rather, they see Muhammad as a prophet, in fact, the last and most important of the great prophets (such as Noah, Abraham, Moses and Jesus). Thus, it came to be that, in 610, at the age of 40, Muhammad began to preach monotheism. One night, Muhammad, accompanied by the angel Gabriel, flew on the back of a winged, horse-like creature to Jerusalem to visit the temple that was built by King Solomon (who, by the way, is also considered to be one of the prophets). At the Temple, Muhammad prayed with Abraham, Moses and Jesus. Muhammad was then carried up to heaven by Gabriel, where Muhammad met God. Because of this trip, Moslems consider Jerusalem to be the third most holy city, after Mecca and Medina (see below). Within Jerusalem lies one of Islam's most holy sites, the Dome of the Rock, which covers the place where Muhammad is said to have stepped as he began his ascent to heaven. During the Night Journey, Muhammad was told several tenets that he incorporated into the basis of Islam, for example, that all Moslems should pray five times a day. In 619, Muhammad once again suffered terrible losses. Both his beloved wife, Khadija, and his uncle, Abu Talib, died. In 620, at the age of 50, Muhammad took a new wife, A'isha and, later, he was to take even more wives. During his years of preaching, Muhammad taught that there was only one true God. However, it took a long time for Muhammad to attract followers. During his years of preaching, Muhammad taught that there was only one true God. However, the prevailing religion was polytheistic (many gods), and it took a long time for Muhammad to attract followers. Indeed, for the next several years, Muhammad gained only a few converts but made many enemies. In 622, after discovering a plan to assassinate him, Muhammad fled to the north, from Mecca to the city of Yathrib, now called Medina. Medina, like Mecca, is also in modern day Saudi Arabia. Ever since that time, Mecca and Medina were the two holiest cites of Islam. In Medina, Muhammad was more successful in converting people to the new religion. Islam flourished, and Muhammad was able to build a theocratic state by combining his religious leadership with political power, a model that would be adopted with great success by later Islamic empires. Indeed, even to this day, devout Moslems believe that there should be no separation between Islam and the political state. Over the next few years, Muhammad enlarged his army and engaged in conflict with Mecca. In 630, Mecca fell to the Muslims. Strategically, Muhammad ordered a general amnesty for all Meccans, which won their loyalty and, within a short time, Mecca became an Islamic city. In 631, Muhammad made a deal with the local Christians and Jews to bring them under Muslim protection. However, they were required to pay a special tax, called the jizya, that was demanded of all non-Muslims. In 632, Muhammad led the very first pilgrimage to Mecca. However, three months after the pilgrimage, Muhammad unexpectedly became sick and, at the age of 62, he died. At the time of his death, Muhammad was survived by 10 wives and several children. However, as I mentioned earlier, only one child, Fatima, would have children of her own. Since his death, Muhammad has been revered by Moslems as the last of the great prophets. Everything about him  his writing, the myths, and every detail of his life  is also revered. It is common, for example, for Muslims to say or write the words "Peace be unto him" or "(pbuh)" every time Muhammad's name is mentioned. For example. you might read, "Muhammad (pbuh) grew up in Mecca. Later, Muhammad (pbuh) moved to Medina." An interesting measure of Muhammad's influence is that, today, there are more male children in the world given the name Muhammad than any other name.